Has a 3.5" diameter rubber pad on top to grip items to be stirred. Additionally this mixer can be converted to conventional single tube mixing by replacing the rubber pad with a mixing cup. Powers up. Is being sold as a "Parts Only" product. This unit does stir but does not heat. Powers on and works. Have multiple available. Please inquire about discount when purchasing multiple units. Rugged and reliable. Variable speed control allows high speed shaking or vortexing with tough metal housing. Operates at 600-3200 RPM. 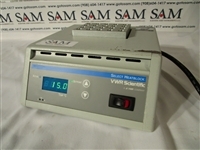 Features variable manual speed controls, touch function, and automatic function. 3" diameter rubberized platform head. Powers up and works great. Powers up. Ready to use. Includes all items in pictures. 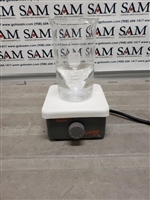 Barnstead Thermolyne Cimarec Magnetic Stirrer Model S131125. Powers up and works. Power cord is included. More than 10 units are available. Please contact us for bulk pricing. A direct drive motor/magnet system provides quiet and strong magnetic coupling, ensuring that the stir bar stays locked with the drive magnet even in viscous solutions. Adjustable speed control is optimized through microprocessor-controlled feedback. Unique StirTrac™ technology offers improved slow-speed stirring, consistent speed control, and stronger magnetic coupling. The StirTrac™ braking feature brings the stir bar to an immediate stop for quick flask removal. Ceramic tops are solid and seamless, formed from a high-performance engineered material that offers high impact strength, acid and alkali resistance, and a reflective, bright white color to enhance visibility. Aluminum tops provide added durability to sustain point impacts that might break ceramic or glass surfaces. The solid, low profile design provides stability and reduces chances for tipping and spilling. Rugged cast aluminum body for optimum stability. Drip edge under top plate channels spilled liquid away from knob and interior components.